Can fascists take over America? American fascism cannot happen anymore because the American government is so large and unwieldy. It is simply too hard for the fascists, or for that matter other radical groups, to seize control of. No matter who is elected, the fascists cannot control the bureaucracy, they cannot control all the branches of American government, they cannot control the judiciary, they cannot control semi-independent institutions such as the Federal Reserve, and they cannot control what is sometimes called “the deep state.” The net result is they simply can’t control enough of the modern state to steer it in a fascist direction. This yields a new defense of Big Government, which is harder to take over, and harder to “turn bad,” than many a smaller government. Surely it ought to give us pause that the major instances of Western fascism came right after a time when government was relatively small, and not too long after the heyday of classical liberalism in Europe, namely the late 19th century. No, I am not blaming classical liberalism for Nazism, but it is simply a fact that it is easier to take over a smaller and simpler state than it is to commandeer one of today’s sprawling bureaucracies. This argument is only moderately convincing. The bureaucratic argument is pretty weak historically. In fact, there is work that suggests that high levels of social capital and the presence of a rationalized bureaucracy made it easy for the Nazis to take over. The argument would have been stronger if Cowen focused on the ways in which the federal system and the decentralization of hard power in America provides real barriers to countrywide fascistic rule (but he is an economist, so “size of government” is a readily available metric). The other weakness in the argument is that Cowen sounds like he has in mind “Rule of Law Fascists” (at least at the beginning). But by definition, these chaps would probably engage in a lot of extra-constitutional means of gaining and maintaining power. And at that point, the only stumbling bloc would be the hard power dispersed in the states. American has a fairly decentralized system of internal projection of coercive capacity (police units are run by states, counties, and cities). These security units could be commandeered by would-be dissenters to challenge a fascist in Washington (states would presumably also race to control all the American military’s weaponry within their borders). America is also too culturally heterogenous to enable a quick takeover by fascists. The fascists would first have to kill a significant number of not only non-European-Americans (going by the demographics of current American fascists) but also a lot of European-Americans before they could install their rule. In the process of doing so, they would begin to undermine the very ethnic and cultural basis of their fascistic rule. A high level of ethnic (and ideological) heterogeneity would therefore mitigate against a rapid rise and consolidation of fascist rule. Finally, while the risk of an outright fascist takeover is remote, the likelihood of ever-spreading pockets of fascism in the American state is very real. Here, too, decentralization plays a role. Because of America’s highly decentralized coercive capacities, pockets of unchecked predatory authoritarianism (fascism-lite, if you will) continue to exist throughout the country — see here, here and here. These pockets persist, in part, because the federal government is considered to be fairly faithful to the ideals of the American constitution. So while fascists may not take over the federal government, they can certainly control local police departments, or even pockets of the federal bureaucracy. The whole post is worth reading here. My hunch is that the next big conceptual move for political economy is to take identity seriously. The task for political economists now is to integrate identity into our theoretical architectures as a conceptual primitive rather than as a nuisance, a behavioral distraction, or as merely a consequence of something else. What would this look like? Take, for example, the literature about preferences for economic integration. One view holds that people’s preferences are a function of their economic interests: in the simplest Stolper-Samuelson world, low skill workers in advanced economies should oppose trade, and high skill workers should favor it. In a world in which ideas are foundational, individuals favor trade because they have learned (or come to believe in) a cosmopolitan worldview in which trade is good—they possess a causal belief about what trade does. In a world in which identity matters, people oppose trade because they are part of a community that opposes trade. The first thing to observe about this identity-based explanation is how vacuous it seems. “One does X because one is an X-doer” is infinitely generative claim, but that is because it is nearly tautological. Here is a more pointed way to think about identity in political economy. When people search for information about what they should do, how do they go about it? One view is that they consider costs and benefits, although not necessarily in a materialist or egoistic way. Another view is that they consider their existing beliefs about how the world works, and then try to apply them by analogy. The third is that they look for cues among the beliefs and actions of people whom they consider to be like them. That third possibility is an argument for identity in political economy. A possible avenue for methodological advancement here would be to treat identity as encompassing a non-transactional political relationship between principals and agents, but with a lot more emphasis on what elites do. Materialist models of politics focus on what politicians give voters. Including identity would simply expand the scope of rewards to include identity affirmation as a central part of the principal-agent relationship (most current works relegate identity to the world of residual psychic benefits of having a co-ethnic or co-partisan in power). One logical implication of this conceptualization is that elites (agents of voters) have loads of arbitrage opportunities under identity politics — and will likely under-provide populist promises of public goods and services. By peddling identity politics, populist politicians can shirk on the delivery of real material benefits for their supporters; which implies further upward redistribution. Politicians will grant their voters honor and respect (by, for example, turning a blind eye to racists and other “anti-PC” movements) and do little else in terms of pro-poor policies. In short, elites stand to gain the most in a world of identity politics. Hillbilly Elegy has been touted as a the guide to understanding Donald J. Trump’s overwhelming support among working class European-Americans. Despite its reputation, Appalachia – especially northern Alabama and Georgia to South Ohio – has far lower church attendance than the Midwest, parts of the Mountain West, and much of the space between Michigan and Montana. Oddly enough, we think we attend church more than we actually do. In a recent Gallup poll, Southerners and Midwesterners reported the highest rates of church attendance in the country. Yet actual church attendance is much lower in the South. This pattern of deception has to do with cultural pressure. In southwestern Ohio, where I was born, both the Cincinnati and Dayton metropolitan regions have very low rates of church attendance, about the same as ultra-liberal San Francisco. No one I know in San Francisco would feel ashamed to admit that they don’t go to church (In fact, some of them might feel ashamed to admit that they do.) Ohio is the polar opposite. Even as a kid, I’d lie when people asked if I attended church regularly. According to Gallup, I wasn’t alone in feeling that pressure. The juxtaposition is jarring: Religious institutions remain a positive force in people’s lives, but in a part of the country slammed by the decline of manufacturing, joblessness, addiction, and broken homes, church attendance has fallen off. Dad’s church offered something desperately needed by people like me. For alcoholics, it gave them community of support… For expectant mothers, it offered a free home with job training and parenting classes. When someone needed a job, church friends could either provide one or make introductions. This is not a political book. Instead, it is simply a powerful narration of a story that is often ignored: that America has millions of poor European-Americans, a good number of whom feel economically and culturally isolated from the public sphere. Vance suggests that this feeling of isolation may have been rendered more acute by the ongoing erosion of the idea that European descent ought to be an automatic ticket to material stability and high social status. I read this book hoping to get an insight into Hillbilly politics, but the key lesson that I came out with is that people organize out of poverty. Atomization is disorienting. Stable homes, communities, and well-ordered societies make a huge difference for material outcomes from generation to generation. History teaches us that the only means of inter-generational persistence of material advancement is through stable and resilient organizations — family units, churches, investment clubs, firms, capable and responsive governments, etc. I highly recommend the book, whether you are interested in American politics or not. As [John] Adams remembered it … “all the great critical questions about men and measures from 1774 to 1778” were desperately contested and highly problematic occasions, usually “decided by the vote of a single state, and that vote was often decided by a single individual.” Nothing was clear, inevitable, or even comprehensible to the soldiers in the field at Saratoga or the statesmen in the corridors at Philadelphia: “It was patched and piebald policy then, as it is now, ever was, and ever will be, world without end.” The real drama of the American Revolution, which was perfectly in accord with Adams’ memory as well as with the turbulent conditions of his own soul, was its inherent messiness. This meant recovering the exciting but terrifying sense that all the major players had at the time — namely, that they were making it up as they went along, improvising on the edge of catastrophe. Of course a real catastrophe would befall the United States more than eight decades after independence in the form of a bloody civil war that killed more than 600,000 (2 percent of the U.S. population at the time). The book is a fantastic page turner. My impression after reading it is that America was lucky that two of its first three presidents were Virginians who represented a social class that was terribly indebted to British financiers. On a related note, I am always surprised by how little Americans know about what happened between July 1776 and George Washington’s inauguration as president in April of 1789. A lot about America that seems preordained in hindsight was terribly contingent in the first decade of independence. As a student of legislative development, I have learned a lot about these turbulent and uncertain years from works on the early state legislatures and the Continental Congress. Peverill Squire’s Evolution of American Legislatures (1619-2009) is my favorite book on this subject. Highly recommended. Those high functioning states (he cites this report) are North Dakota, Wyoming, Nebraska, Utah, and Iowa. It is not obvious to me why Republicans would not look to the entire map of places that the GOP controls state government. Maybe one clue is that those five states are among the whitest states in the country. As an exercise, let’s ponder what “They think the rest of America should be much more like those places” means. It is easier for intelligent foreigners to buy more heavily into the Democratic stories. They feel more comfortable with the associated status relations, and furthermore foreigners are less likely to be connected to American state and local government, so they don’t have much sense of how the Republicans actually are more sensible in many circumstances.any circumstances. I don’t know what to make of this. I’ve never lived in a fully Republican controlled state. All I know is that Republican governors and legislatures have a knack for cutting taxes at the expense of essential public goods — like schools in Kansas or drinkable water in Michigan; or refusing to accept federal dollars to finance healthcare for their poor voters in the name of ideological purity. I also know that for all their talk of ideological purity when it comes to social spending, Republicans’ preference for the size of the social safety net is conditional on the proportion of the population that is of European descent. This is not to say that Republican elites are evil or anything. They are simply self-interested. 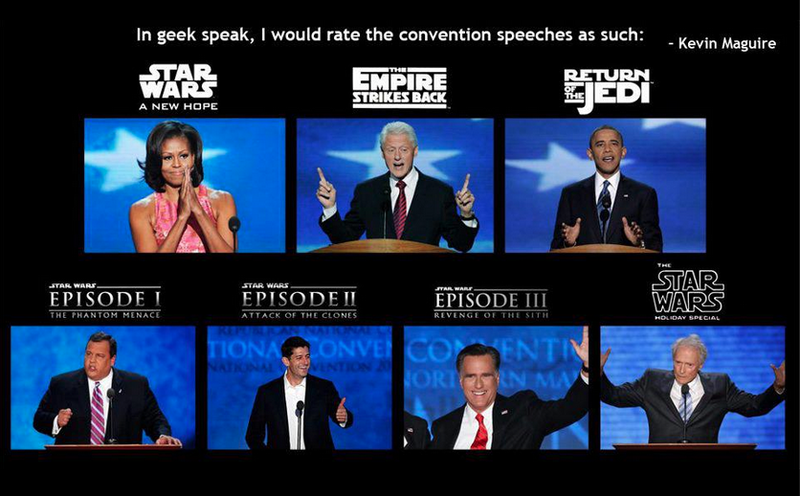 Instead, it speaks to the awkwardness of the Republican coalition. In Cowen’s language, in the current historical moment I see Democrats as a coalition that peddles status and some goodies to boot. Republican elites, on the other hand, traffic almost exclusively in status, while opting for lower taxes and fewer regulations for elites. This may work during boom times. But in tough economic times a shared status (codified by say, race) might not be enough to convince the working poor that they are natural political allies with either anti-tax business owners or the editors of the National Review. And if we are honest, it doesn’t help that we’ve just had 7+ years under a president from a historically low status group in the American context. There is strong evidence linking skin complexion to negative stereotypes and adverse real-world outcomes. We extend these findings to political ad campaigns, in which skin complexion can be easily manipulated in ways that are difficult to detect. Devising a method to measure how dark a candidate appears in an image, this paper examines how complexion varied with ad content during the 2008 presidential election campaign (study 1). Findings show that darker images were more frequent in negative ads—especially those linking Obama to crime—which aired more frequently as Election Day approached. We then conduct an experiment to document how these darker images can activate stereotypes, and show that a subtle darkness manipulation is sufficient to activate the most negative stereotypes about Blacks—even when the candidate is a famous counter-stereotypical exemplar—Barack Obama (study 2). Further evidence of an evaluative penalty for darker skin comes from an observational study measuring affective responses to depictions of Obama with varying skin complexion, presented via the Affect Misattribution Procedure in the 2008 American National Election Study (study 3). This study demonstrates that darker images are used in a way that complements ad content, and shows that doing so can negatively affect how individuals evaluate candidates and think about politics. The paper is titled “Bias in the Flesh: Skin Complexion and Stereotype Consistency in Political Campaigns,” by Messing, Jabon, and Plaut. The average adult American (regardless of party ID, ideology, race, or region) grew up in an era in which news media and popular portrayal of Americans of African origin (and for that matter, Africans) was far worse than it is today. So findings like these, and their real political and economic consequences, are gonna be with us for a while. This is a guest post by my colleague at Stanford, Lauren Prather, who works on the determinants of individual attitudes towards inequality, poverty, and redistribution, in both domestic and international contexts. Does the American public oppose giving cash to poor people in developing countries? Giving cash instead of in-kind aid like food is a hotly debated subject in development circles and has recently received increased attention from the media. The apparent success of GiveDirectly, a charity that gives unconditional cash transfers to poor people in Kenya, has added fresh fodder to the discussion. Even the Obama administration entered the fray earlier this year by proposing changes to the way U.S. food aid is distributed. Traditionally, much of the food aid provided by the U.S. government is procured in the U.S. and shipped abroad. The reforms would relax these requirements and include more flexible approaches to food aid provision including possibly giving cash or vouchers to people in poor countries to help them buy food locally. Proponents of cash transfers argue that the poor know their needs best and therefore giving cash is a more efficient way of providing aid. With food aid in particular, providing aid in kind can be more expensive and can damage local economies by driving out local farmers. Giving people cash on the other hand can allow them to buy food locally, which can be more cost-effective for donors and can actually support local agriculture. What are the political constraints to reforming aid to include cash transfers to the poor? While most of the opposition to the food aid reforms has come from the farm lobby, public opinion may be another constraint. Indeed, research on American political attitudes suggests that Americans oppose giving cash to the poor, at least to poor Americans. But do Americans exhibit the same level of opposition to cash transfers targeting the foreign poor? To shed light on this question, I used a randomized experiment embedded in a survey fielded in July of 2013 to a representative sample of 1,000 Americans. In the survey, I gave individuals a fictional news article that described a government hunger relief program. The news article contained two experimental treatments. In the first treatment, I randomly told half of the survey respondents that the program gave the poor cash, while the other half read that the poor were given food. The second treatment was randomized independently of the first treatment: half the respondents were told that the program helped Americans and the other half read that it helped people living in other countries. After reading the article, survey respondents were asked whether or not they thought the government should cut the program. The results were surprising. Among those who read about the foreign hunger relief program, the cash treatment had little effect: 45% of respondents thought officials should not cut the program giving food, while a similar 43% thought officials should not cut the cash program. For those that read about the domestic program, however, the results were more expected: 72% of respondents wanted to keep the food program, whereas only 58% wanted to keep the program that gave the poor cash. Two important conclusions can be drawn from these results. First, policymakers shouldn’t necessarily look to how the public thinks about domestic welfare programs to predict how they would respond to similar foreign aid programs. 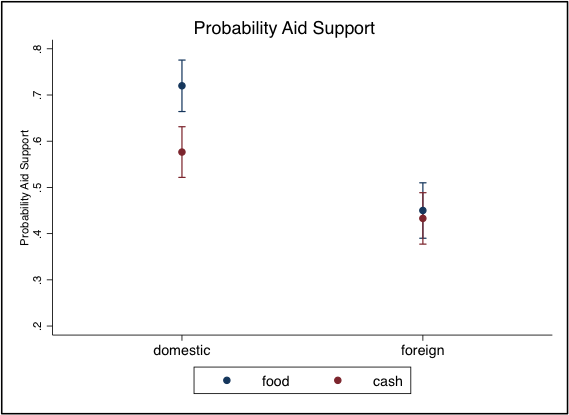 Instead, it appears that support for foreign aid remains relatively low regardless of whether the aid is distributed in kind or in cash. Second, advocates of giving cash to the poor in developing countries need not fear the public; at least not any more than is usual for foreign aid. In the eyes of the public, the real issue seems to be whether to give any foreign aid at all. Sometimes politicians get out of character and reveal the naked truth about the strategic logic of hunting for votes in a two-party electoral system. Briefly stated, the median voter rules (also check this out). For more on this check out the piece on the Times website. In short, all the carrots that U.S. diplomats are offering the Sudanese president seem to be working. Among the prizes for Khartoum are a U.S. promise to remove Sudan from its list of terrorism-supporting states and a possible visit by U.S. Secretary of State Hillary Clinton, according to the Sudan Tribune. Earlier this month, U.S. State Department officials also signaled that they would be ready to begin normalization following Sudan’s acceptance of the vote. While the US approach has yielded good results in securing the secession referendum in the South, American policy in the wider region leaves a lot to be desired. Washington appears to be ready to cut a deal with any dictator, as long as they serve a short-term US need. America needs to do more on Darfur. America needs to do more in Ethiopia, where Meles Zenawi continues to reign with an iron fist without any pretense of respecting human rights. America needs to do more in Uganda, where Museveni has emerged as an anti-terror crusader who does not care for any liberal (in the classical sense) ideals. The choice between protecting American interests abroad and respecting the rights of other peoples of the world is a false choice. Liberty (the world over) is not incompatible with American security. The ideals embodied in the federalist papers, the American declaration of independence, and the first amendment of the US constitution should not be confined within the US borders as far as American policy goes.